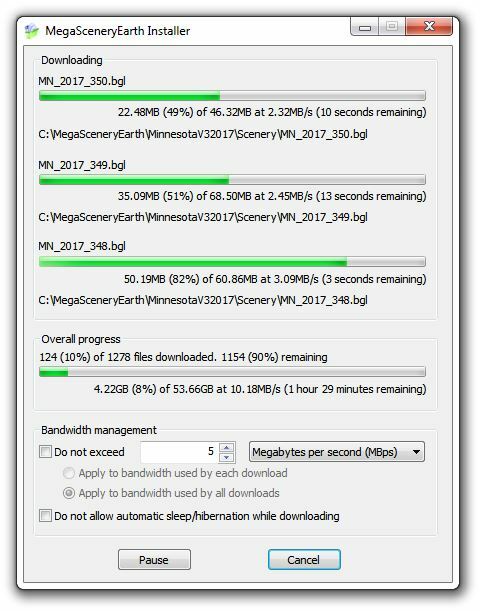 Our new one click MegaSceneryEarth Installer totally streamlines the installation process for each area you purchase and simultaneously downloads and installs your MegaSceneryEarth area(s). As simple as it may appear and as easy as it is to use, it has been deeply thought out and created to optimally simplify installation while ensuring full integrity of the installation of your area. It downloads the ready-to-use BGL files directly to your hard drive so that no unzipping of any files is ever required. It automatically adds the appropriate paths of your scenery files to the Scenery Library of your flight simulator - FSX, FSX:Steam, Prepar3D. You can fly your scenery and use your computer for other purposes while it is downloading and installing. As soon as the MegaSceneryEarth Downloader window appears, your flight simulator scenery configuration files have been updated and you can actually fly part of your scenery while the download occurs in the background. It won't update live within your simulator but will repopulate indexes next time you launch your flight simulator. Our installer will never hang your flight simulator due to a partial bgl file being present. If you cancel your installation at any time, all you need to do to resume your installation is to relaunch your installer and the downloader will not redownload files that are already downloaded and in place. It will quickly verify the integrity of the files that already exist and then will add the files that were not downloaded before you canceled. The downloader downloads BGL files sorted by natural order so that your state will populate top left to bottom right (same direction as reading). If we were to update any files or correct any BGL files, all you would need to do is run your installer and it will download and replace only the pertinent "patched" files. If your download is interrupted by a power outage or your computer is reset during installation, the installer will never cause a state that may freeze your flight simulator when you try run in the event that a BGL file was partially downloaded. In the event that your download was interrupted by a computer shutdown, rerunning your installer will resume where it left off. The installer doesn't touch any other files in your simulator besides scenery.cfg and fsx.cfg and where it simply adds a text entry to your scenery library and only with your permission, Scenery Optimizer, changes a few graphics settings respectively. The only other thing the installer does is to save BGL files to your selected installation folder. No other files in your flight simulator installation are touched or modified. The installer is multi-threaded. It downloads three files simultaneously. This improves overall download speeds because a single file that may be downloading slower than expected is not slowing down the entire download since other files are simultaneously downloading at regular speeds. You can run multiple different installers to download and install multiple titles simultaneously. The installer gives very accurate calculations of expected download times based upon moving average of your download speeds. It will download as fast as your internet connection will allow or at the speed you specify under bandwidth management directly from our high performance servers operated by one of the best cloud providers in the USA. We serve multiple terabytes of Megasceneryearth scenery per day to our users. Users have a wide range of speeds for their internet connections. These days most users have a connection speed anywhere between 100 Mbps and 1 Gbps. At these speeds most tiles will install within 5 minutes to 2 hours. Please note that your ISP quotes speeds at megabits per second while our installer shows speeds at megabytes per second. If you have a 100 megabit connection the downloader will show a speed "around" 10 Megabytes per second. It will always be slightly slower - at 8 to 10 but it will not be the 100 number you may be expecting since it is a different scale. On rare occasion, customers report download speeds that are far slower than their internet connection will allow. If you are experiencing slow download speeds, the cause, 95% of the time, will be related to your antivirus software which is scanning files as they are downloaded. We have no control over this behavior which is behavior that is inherent in your antivirus program. A second cause may be your VPN if you are using one. Turning off your VPN may improve slow speeds for some users. A third cause of slower than expected download speed may be caused by a slow switch the data may encounter in the path from our server to your PC. Data takes a long journey on its way from our server to your PC and on this journey makes its way through numerous pipes and switches. A slow switch or other traffic congestion may slow down your download. If you are experiencing a slower than expected speed, you can check whether traffic congestion is the cause by going into a Command Prompt and entering the command tracert www.megasceneryearth.com. This will output information regarding to the path and response times via each switch. The response times should normally be under 100 ms. If you see any that timeout or are 1000 ms or longer, this may be causing your download to be slower than expected. Nothing can be done to correct this but these issues generally self-resolve when the congestion clears or the provider of the network corrects the issue in their network. This isn't common but it can and does happen. This issue also only occurs rarely and is also caused by your antivirus hanging or getting stuck on a scan or caused by something on your system not allowing renaming of tmp files in your installation directory. 2. Enter the directory that you were installing to e.g. X:\MegaSceneryEarth\State\Scenery and delete the .TMP file that is in the folder. The installer will resume from where it was stuck. The fixes in the Slow Download Speeds section above may also be implemented if you experience this issue. If you fail to activate your license number or hit cancel at the activation screen at the beginning of the installation, the downloader will only download 10 files and will report to you that you have failed to activate. Please follow this link for issues relating to license numbers and activation. With the new install system, you no longer have ZIP files that contain installers that you need to go through the process of unzipping and running. To back up your scenery for future convenience and quickest way to reinstall in the future, simply make a copy of the folder X:\MegaSceneryEarth\State\Scenery and all the BGL files that are in it to another physical drive whether it is an internal drive or portable external hard drive. If you ever need to reinstall the scenery, simply copy the folder X:\MegaSceneryEarth\State\Scenery and all the BGL files that are in it back to your normal hard drive and simply Add To Scenery Library using these instructions. These instructions apply to FSX, FSX:Steam and Prepar3D. With regard to your installation launcher/setup file e.g. WashingtonV32017_Setup.exe. We suggest that you save that to a safe place on your hard drive in the event that you do need to actually redownload your scenery sometime in the future. Of course you can always retrieve this file from your order history but it's easier to simply retrieve it from your hard drive than to login to your account and retrieve it from your order history. Doing these steps relating to backing up your scenery now can save you some pain in the future. It is always much easier doing things from local copies and backups than going through download procedures. Portable external hard drives are cheap and you can purchase a 4Tb drive for around $100 to $120 and is a very worthwhile investment for backing up your precious data.